Phoenix sent its first images of itself and Mars’s surface, which indicate that all is well with the spacecraft. The lander is stable, the solar arrays have deployed, and Phoenix appears to be sitting on a smooth, landscape that is just what the scientists were hoping for. “It looks like a good place to start digging!” said Dan McCleese from JPL. This image of Phoenix’s solar arrays indicates that the arrays have deployed fully. Data indicates the batteries are fully charged as well, meaning the solar arrays are working perfectly. This image shows the lander’s footpad planted quite nicely, not sunk into the surface at all. This indicates great stability for Phoenix. 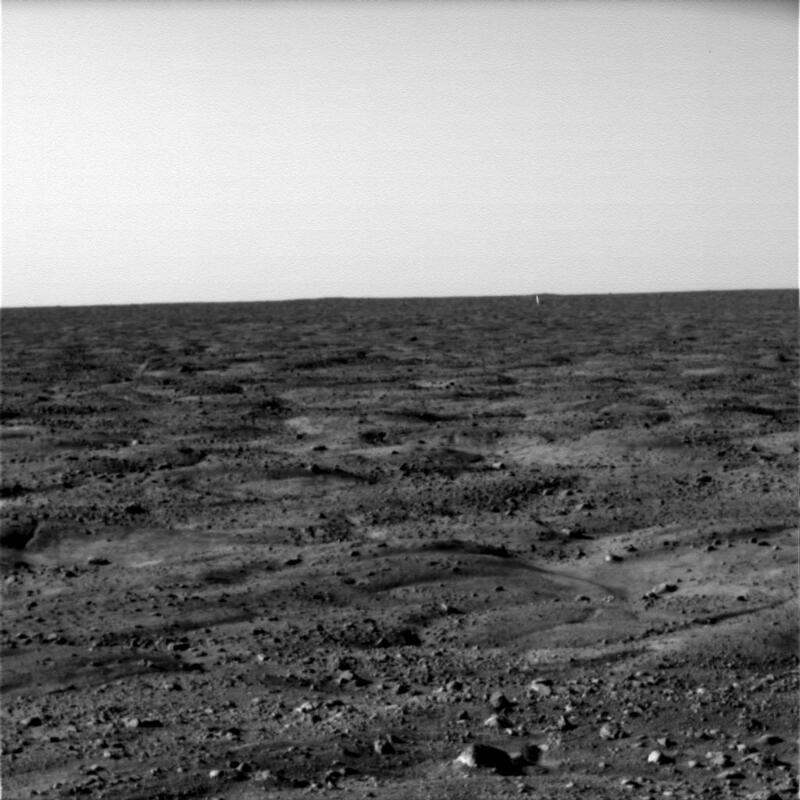 This is a second, and not quite complete landscape image that Phoenix sent back to Earth of its surroundings. YESSSSSS!!! Congrats on a safe arrival and landing! Good luck on the science mission!! Now then, hows about some more images?!! I’m spanish and I follow the landing on NASA TV. The first images are great. ^Just at the edge of the horizon, about two-thirds of the way from the left, a little vertical white mark â€” dust on the lens, lens flare, a jpeg artifact, a glitch in the CCD/CMOS of the camera â€” ? CONGRATULATIONS Pheonix ! !Wishing you al the best all the way 😀 :] Find us some life! What wonderful news! I’m in a celebratory spirit! Get a life……….Doesn’t look like a real inspiring place to look for life. The Mariner Valley seem’s more scenic. I also noted the lack of Martian plants on the surface……. Amazing shots. Great detail. Am also wondering if there will be color images? I remember hearing on Nasa TV that Phoenix does have the ability to take colour images, but I guess it’s not a priority right now. When the orbiter is overhead, Phoenix will be transmitting more important data because the mission is in the characterization phase. I’m looking forward to those colour pics though! I still do not understand how liquid water could ever exist for any reasonable length of time on Mars. I’ve never heard a reasonable explanation. It’s COLD on Mars! The reason for black and white is that you get higher quality and less noise (among other benefits) when you dedicate the entire CCD to luminance (this is not exactly correct, but it will suffice). In any event, the primary reason for NASA besides the quality, is that you can pass various filters in front of the lens and get all sorts of results. You can also derive color images by taking passes behind Red Green and Blue filters. In addition, you can use infrared and other filters sensitive to various elements. Super Duper! Nice Flying Phoenix! I wonder if we’ll see the parachute? Once the orbiting Mars Odyssey spacecraft zero’s in on the location, we’ll surely see images of the discarded parachute. Standby because we’ll also see the Phoenix Lander itself bravely resting on this alien tundra. That white thing was a periscope from a recon vehicle sent by the Martians that live in “the pyramid complex” near the Face on Mars at Cydonia. The ‘soil’ surrounding the leg of Phoenix was disturbed as much as I would do here in earth walking on a sandy beach! An immense success for the NASA scientists. Very well done indeed..
That vertical white mark you talk about Kevin sure looks like something, I could imagine that it could easily be the heat shield wedged into the ground, I eagerly await news on this, at the moment it seems to have been largely ignored by most media outlets/websites so thanks for pointing me to this, would not have seen it otherwise and now i know what the reporter in the press conference was on about, unfortunately the nasa guys fobbed off his question, generally they seem very reluctant to say anything that might be proved wrong later, can’t entirely blame them for that but it is frustrating. The phoenix official website does not have this photo displayed yet, i guess they are trying to keep it low key to avoid too much attention until they have had a chance to verify for sure what it is. Someone did joke that it was a polar bear, probably some tabloid paper is now reporting this as a serious comment. Yah, I’m interested in confirmation, but I actually wouldn’t be too surprised (or skeptical) if the official explanation were along the lines of just a CCD glitch. It could certainly be a man-made object from this or another mission (heat shield, parachute part, etc.) although the odds of something appearing within Phoenix’s field of vision are probably pretty low. I’m curious as to whether it is reproducible (as opposed to something that appears only in that early photo) — and if so, how far away it is. They named this mission Pheonix due to the fact that the first polar lander crashed and burned in 1998 and this is due to rise from the ashes of that mission. Does anybody remember the 1998 Polar mission that crashed because they forgot to change the calculations from feet to meters? The lander thought it was 10 feet off the ground (ish) when it was in fact 10 meters off the ground. Previous PostPrevious Welcome Back to Mars: Phoenix Lands Successfully!